Leaside volunteers Sheila Riggs, Lucy Burke, June and Tanyss Malabar. 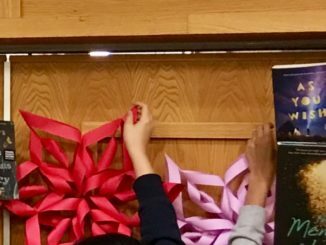 On Thursday, December 20, 19 volunteers from Leaside United Church (LUC) made the short trek to Valley Park Middle School where they served dinner to 125 members of the neighbourhood as part of a monthly community dinner program organized by the Reverend Beverley Williams of Flemingdon Park Ministry (FPM). 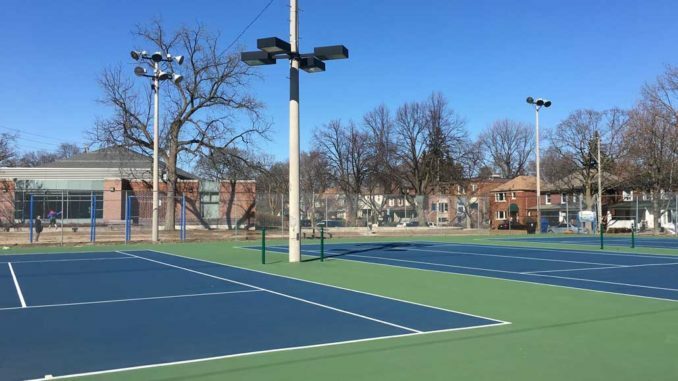 After Leaside United and Presteign-Woodbine United in East York amalgamated in June 2017, the expanded Outreach Committee committed to “broaden our footprint” in the local community, according to committee member Sheila Lacroix. That means more involvement in local, regional and international groups. The committee then researched a number of local organizations looking for projects to support. 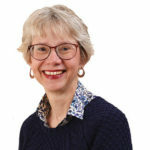 Lynda Miller, another committee member, said they were very interested in the work of FPM because it is in a neighbouring community where there is a definite need. 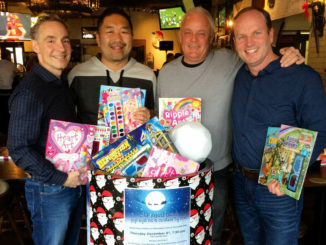 In the past, the dinners have been sponsored by several organizations, including Bishop Strachan School, St. Clement’s Church and accounting firm Stern Cohen LLP. the Reverend Beverley Williams says that many organizations now have a mandate for social responsibility, and sponsoring these dinners at the cost of $1,200 per meal is seen as an effective way to pursue that goal. 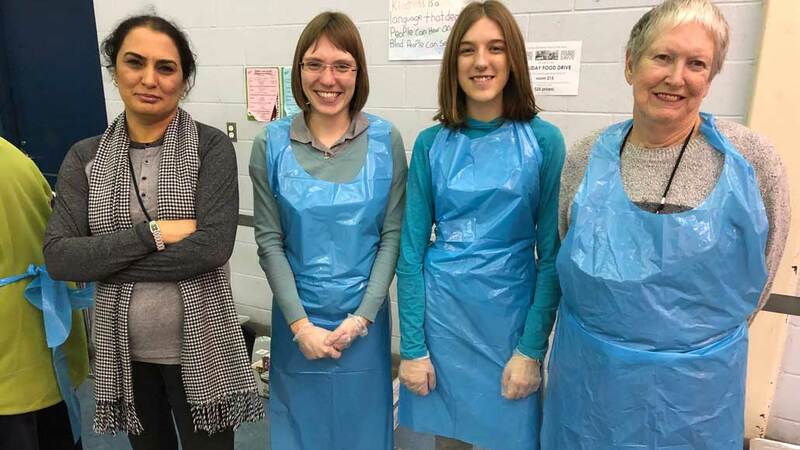 FPM’s Banazir Yousofi and volunteers, Natalie Jahn, Madison O’Brien and Margaret McRae. 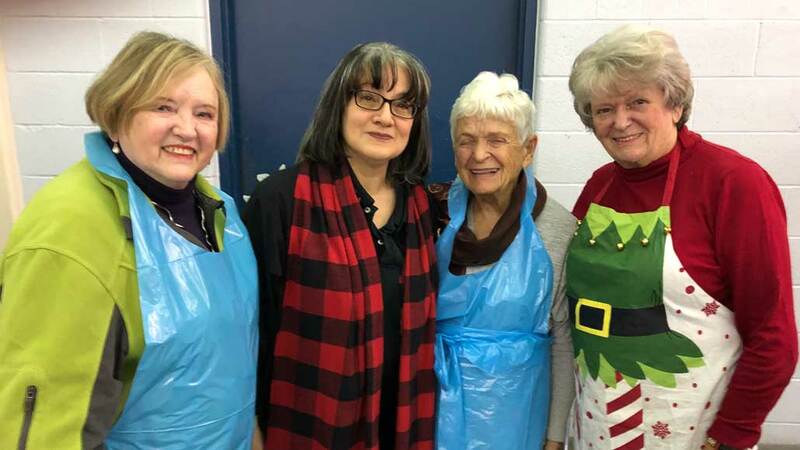 On Dec. 20, the Leaside volunteers set up the gym and organized the food catered by Pakwanchi Restaurant in Scarborough, one of four regular caterers used by FPM. The halal meal consisted of chicken, beef, rice, mashed potatoes, vegetables, salad and rice pudding. The volunteers served heaping plates of food “restaurant style” to encourage interaction with the diners. In fact, one volunteer, Sheila Riggs, was pleased to encounter a woman from her English Conversation class at Thorncliffe Neighbourhood Office and her husband. Volunteers enjoyed reaching out to another community. One mother, Cara Brown, thought it would be good for her young sons, Lucas and Tyler, to volunteer during the holidays. 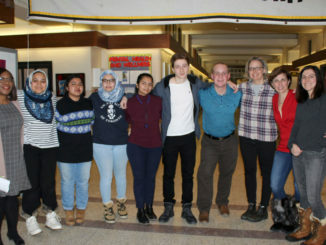 Natalie Jahn, the new young families and youth leader at LUC, enjoyed the “nice group atmosphere,” and Tanyss Malabar said that both diners and volunteers had fun.